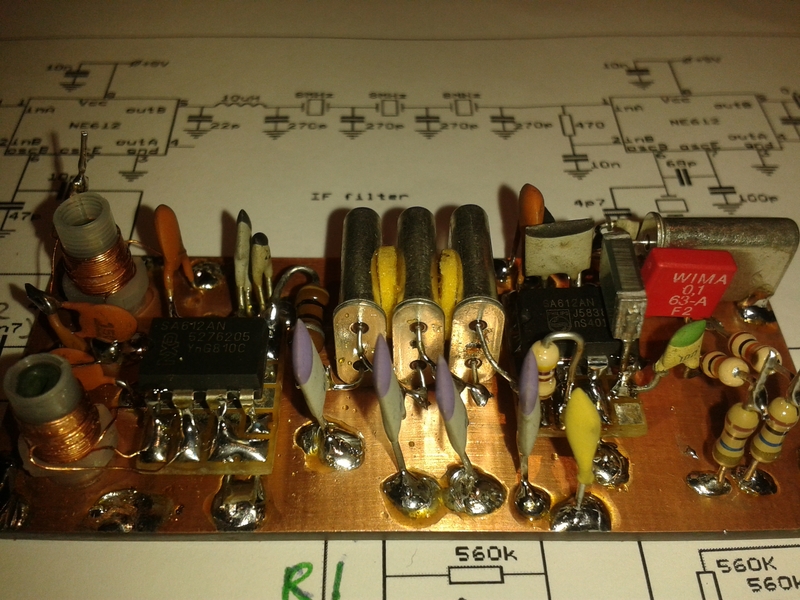 Now all LF parts and the VFO were finished, it was time to build the RF-part of the receiver. This receiver consists of multiple sections. The first section is the (fixed) preselector, which is a combination of a bandpass filter for 10 MHz and a band reject filter for 6 MHz. The 6 MHz band must be filtered out, since this band contains lots of strong AM broadcast stations and is also the mirror frequency for this receiver: the input signal is mixed with the 2.10-2.15 MHz VFO frequency. The 10 MHz band is mixed down to the 8 MHz IF (10.1 – 2.1 = 8 MHz). simultaneously 6 MHz is mixed up to 8 MHz (5.9 + 2.1 = 8 MHz), disturbing our reception. So getting rid of the 6 MHz is very important. I soldered each mixer (SA612) onto a very small part of breadboard (6×4 pads), with the solder side upward. Then I put the breadboard on my desk and placed the DIL-8 packaged chip in the center. Along each row of pins a row of pads remains unused for the moment. The pins of the chip line up with the (normally) component side of the board. Then I soldered the pins to the pads, with the chip package on a small distance of the board. Finally I soldered the directly connected components on the unused pads (through-hole mounting is not necessary) and connected them to the corresponding pin. Just behind the first mixer is the IF filter. This is made of 3 crystals of 8 MHz. The output of the filter is inserted in a second mixer with an 8 MHz fixed oscillator. The output is the LF signal, ready to be inserted into the LF filter and amplifier. 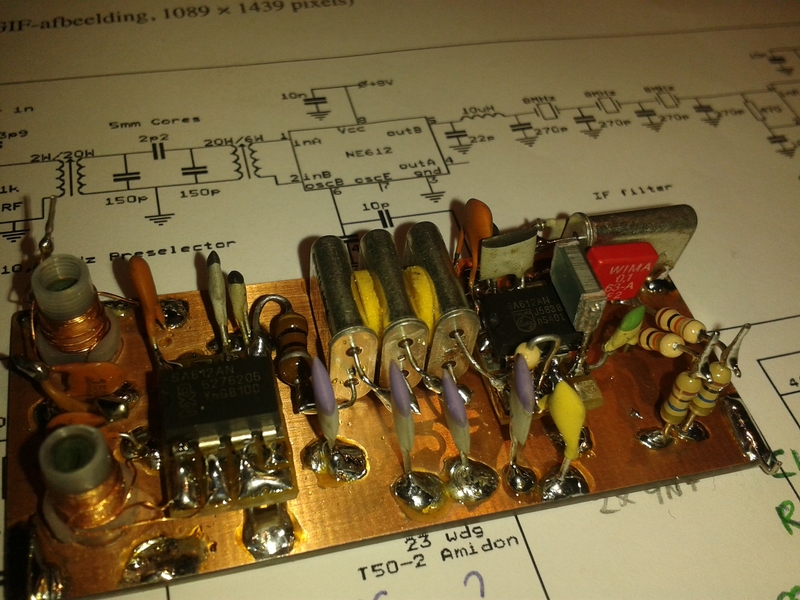 I managed to put the preselector, IF filter, both mixers and the 8 MHz oscillator at a small piece of copper clad, which measures only 7×3 cm. See the pictures how I did this! Another view of the receiver part of the 30m QRP transceiver.